I know I promised you an outfit post, but I think this is something a little bit more interested.. well I'm sure you all remember a post I did, not long time ago, which talked about one of my obsessions.. tattoos of course! Well my lovelies if you follow me on Facebook or Twitter than you already know that..I DID IT!!!!! Here's my baby and although the quality of the photo isn't very good (I apologise for that), I believe you can all see how it looks like! For all of you interested it's a latin quote, which in English, it would be translated as "Everything happens for a reason" which is kind of my moto in life! 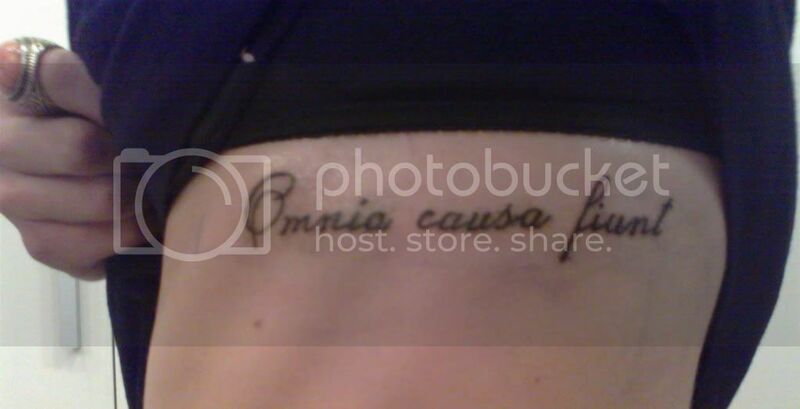 I love it <3 I like the quote too! I love ur new tattoos! It is beautiful! I always love text tattoo's! Great tattoo! Thank you for visiting my blog! Thank you so much for your comment! Your blog is great as well. Would you like us to follow each other? i love your blog and of course i follow u!